Earlier this week I had my "night off" (see what I'm talking about here) and I took advantage of it by decorating pumpkins. Well Hannelore did help me with one of them. It was so fun. I love how they turned out. Hannelore helped me pick out the ideas that I was going to use as my inspiration. So she was involved a little bit in the process. She painted her own pumpkins at her Halloween party (here). These 4 pumpkins took me an hour and a half from start to finish. This includes cleaning the pumpkins, prepping everything, and adding the finishing touches. I do not think that is too bad. 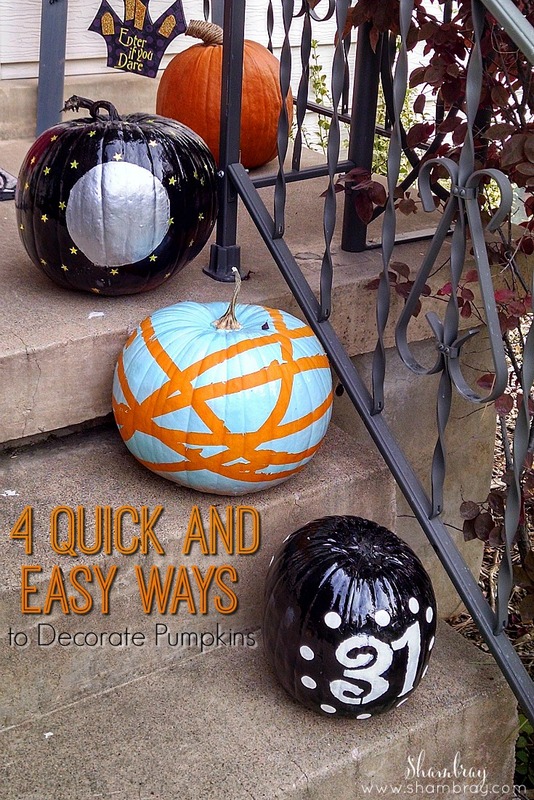 Also, I have to start off saying that these are relatively mess-free ways to decorate pumpkins. My hands got a little paint on them, but not too bad. They are not as mess-free as vinyl and not as precise as vinyl, but I liked the look of them not being exact. Wind jute around the stem of the pumpkin. I love the simplicity of this. I also love jute. Can you tell? I have been using it a lot in my projects. I hot glued the beginning of the jute to the base of the stem. I hot glued the jute in places that needed "help" staying where I wanted it to stay. Then I hot glued the very end of the jute. Done! So easy. This one was for my baby girl. She is in love with the moon and the stars. She looks for them every night and during the day she talks about them. 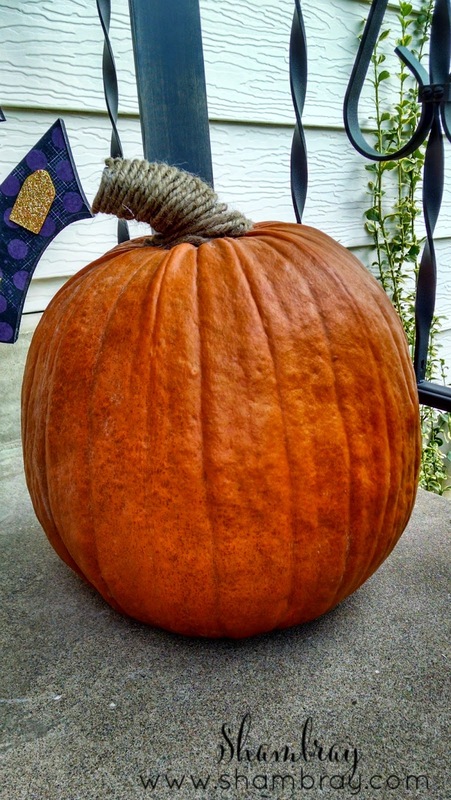 Again, this pumpkin is very easy. I spray painted the whole pumpkin black, stem and all. 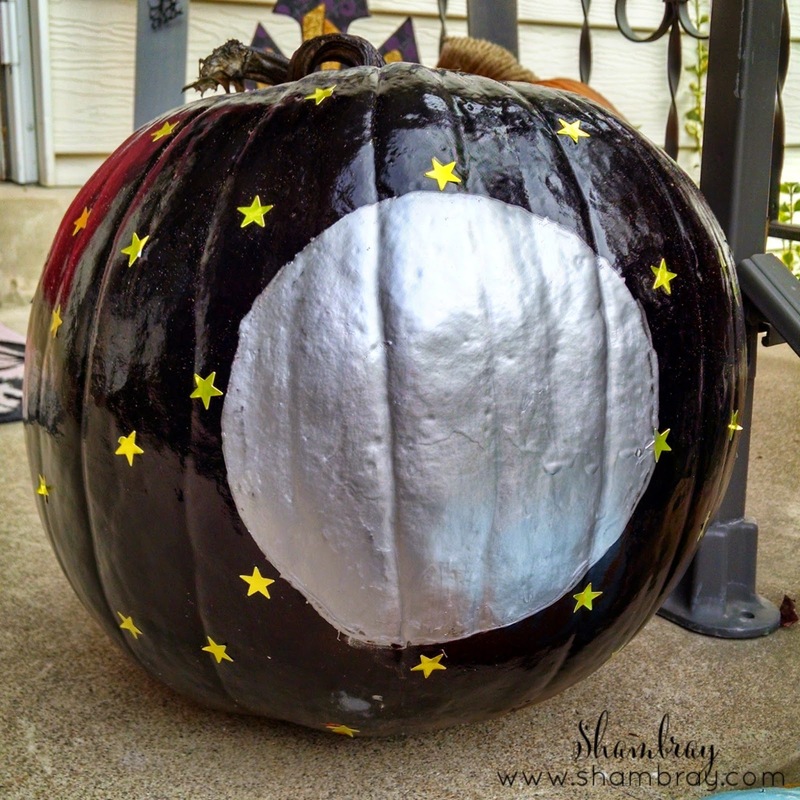 After the paint was dry I decided where I wanted the moon and painted it silver (I did a full moon because it is more Halloween-y, unlike the inspiration picture). Then I randomly placed the gold star stickers all over the pumpkin. Done! Hannelore LOVES it! 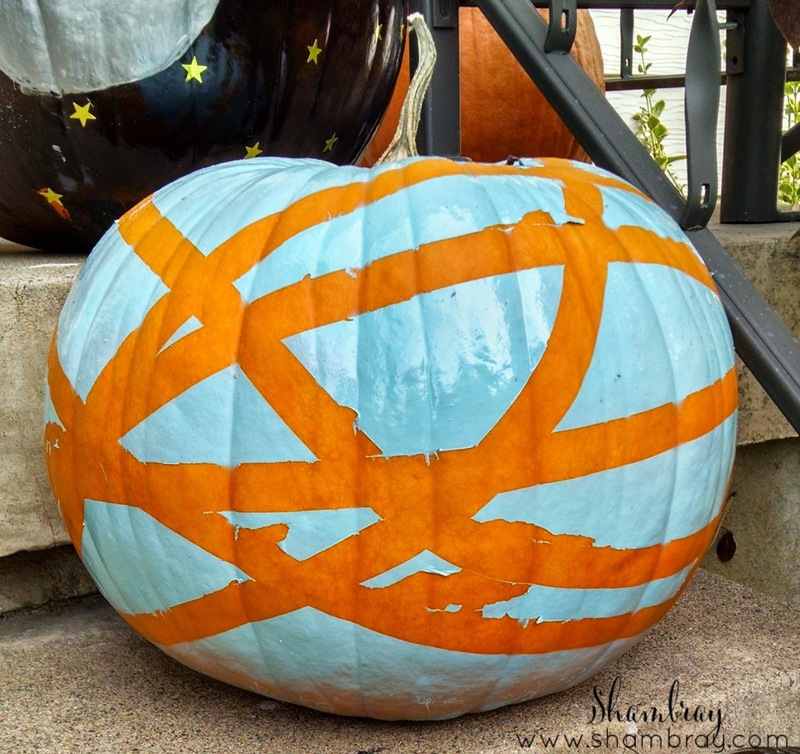 All you have to do is randomly place masking tape all over the pumpkin. This is the one Hannelore helped me with because she told me where to put the tape. She thought it was silly. I taped off the stem so that it would be it's natural color. Then I spray painted it a blue color. After the paint was dry I pulled off the tape. So I have to tell you something....I used electrical tape. I searched and searched for our painters or masking tape and could not find it anywhere. So that was one thing that I did not do right. I also did not push down the tape as much as I should have. I did a trial and I was not too concerned with it being Halloween and all. I felt like it did not have to be perfect. (I would NOT have done this if I was painting something that I would not be throwing away in less than a month.) I also pulled some of the paint off when I pulled the tape off because again I was doing this with my daughter and it was not supposed to be perfect. It was supposed to be abstract and it was supposed to be unique. I still love it. Just the way it is! However, if you want yours with more crisp lines then use masking tape and make sure you push down the edges as you wrap the pumpkin. Especially on the lines of the pumpkin. Done! I love the pop of color. Spray paint the pumpkin black. This one did not have a stem, but I painted the lack of stem black as well. After the paint was dry I painted the white "31" using a stencil. I used the same stencils as I did on the burlap banner (here). Then I used the spouncers (again from the banner) to put the circles around the "31". On the back side of this pumpkin I did my house number. I didn't really like it because our house number is only one number and it looked funny. I had a feeling many people would be asking me what it meant. I also thought about doing an "M" for Matthews, but my wreath already has an "M". I did not want to go overboard. However, those are all ideas you could do on your pumpkin if you choose to duplicate this one. Done! I kind of like this one! I am crushing on that 31 pumpkin. 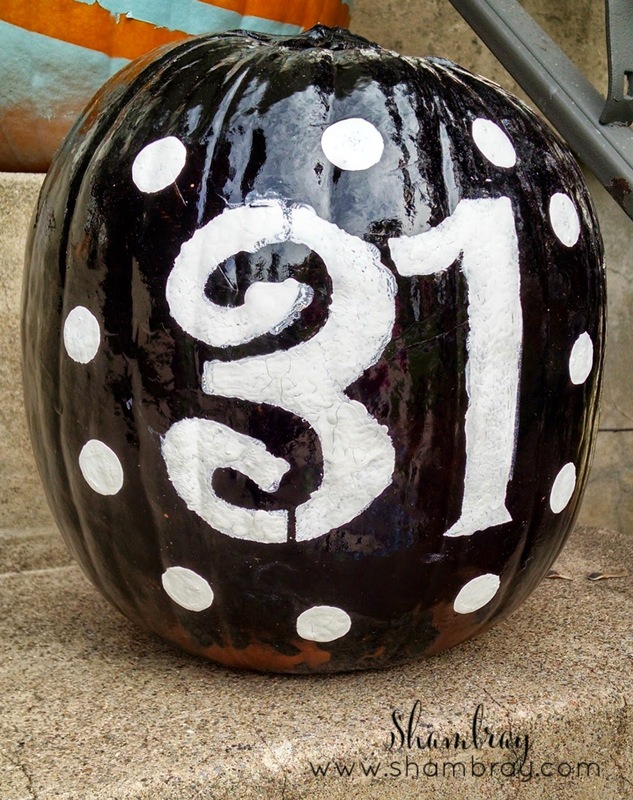 Probably the black and white polka dots--I'm going to try painting my pumpkins this year! I like quick and easy projects like these! I am sharing this post tomorrow in a collection of Halloween Ideas from our link party. Thanks so much for sharing! That pumpkin is my favorite too! I think because of the polka dots as well. YAY! I will stop by and check out the post! Can't wait to see the other ideas!